Lead (Pb) is a heavy metal that is a major environmental and health hazard. It is rarely found directly in source water, but can enter drinking water via corrosion in pipes. Homes built before 1980-ies in USA are more likely to have galvanized or lead pipes, fixtures, and solder. Newer homes are also at risk as lead regulations prohibiting usage of lead-based compounds in faucets only took effect in 2014. Before that date, pipes may have contained up to 8 percent lead and still be called "lead-free". Exposure to LEAD causes a variety of health effects, and affects children and newborns in particular. It can damage kidneys, nervous and reproductive system, and especially harmful to developing brain of fetuces and young children. EPA has more information on lead's health effects, sources and guidelines. Water is the main exposure point in old buildings with lead pipes and old fixtures. Removal of old pipes is a very costy method, and often is unfeasible. 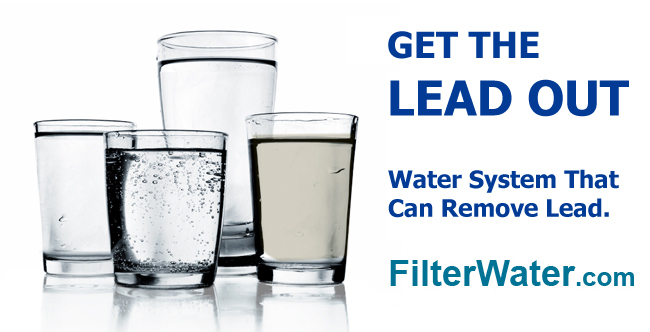 We offer a variety of Lead-Removing Water Filters that can limit your and your family's exposure. The amount of lead that can be dissolved in water greatly depend on acidity ( pH ). If your water is acidic ( pH is below 7.0 ), it is good to have a Whole House Acid Neutralizer System to prevent corrosion and higher levels of lead. The Watersafe Lead Test can detect dissolved lead at levels below the EPA Action level of 15 parts per billion (ppb). A test strip with yes/no result that detects presence of lead in drinking water.